Until a few years ago, a typical Excel-based application was almost entirely contained within Excel itself; the only external interaction would be with the user, from whom you obtained data and to whom you presented results. If you needed to store data, you'd use separate workbooks and try to mimic a relational database as best you could. As data access technologies developed, from ODBC drivers through DAO to the current versions of ADO (documented in Chapter 20), it became more commonplace to store data in external databases and retrieve data from (and update data in) other systems across the network. It is now quite common to see Excel used as a front-end querying and analysis tool for large corporate databases, using QueryTables and PivotTables to retrieve the data. The data available to Excel applications was, however, limited to what was available across the company network, and to those databases you could get permission to access. Starting with the release of Office 97, Microsoft has slowly extended Excel's reach to include the Internet and associated technologies, either by adding native functionality directly to Excel (such as Web Queries), or by ensuring that Excel developers can easily use standard external objects (such as the Internet Transfer Control, the Web Browser control, and the MSXML parser) and including those objects within the Office installation. 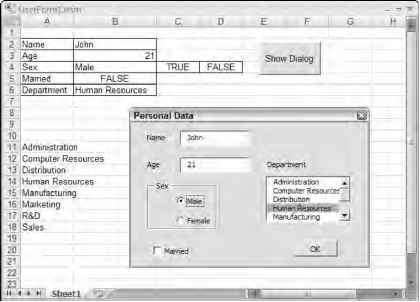 In Excel 2007, you have sufficient functionality to think outside of the pure Excel/ADO environment in terms of obtaining data, publishing results, monitoring applications, and sharing data with many disparate systems across the Internet. This chapter introduces the functionality available in Excel 2007 and demonstrates how to use some of it to exploit the Internet within your applications. A complete discussion of all of Excel's Internet-related functionality is beyond the scope of this book. Note that throughout this chapter, the term Internet is used in its broadest sense, covering both internal and external networks. The chapter assumes a basic understanding of the Internet and how it works. The examples use a web server running on a local PC. However, these techniques are equally applicable to applications running on a remote server.